This is our ‘san goong yan’ (new maid) – I whispered to the neighbourhood kids – as we sneaked our heads over the doorway to our flat. We wanted to stealthily check out the lady who was washing our clothes in the bathroom but she spotted us immediately. Yin ‘Chee’ (‘sister’ Yin) was only about 17 when she started working for us; she still remembers the scene and thought the sight of a bunch of heads popping up to take a peek at her to be really cute. 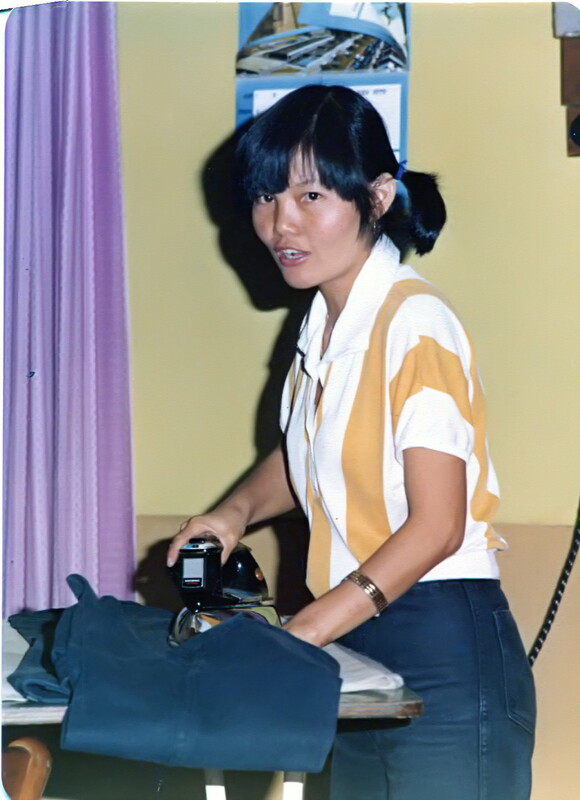 I was about 5 years old and we’d already been through a number of low-skilled nannies/housekeepers since my mom used to help with the family business. I remember the horror stories about the one who used to sit precariously on our 11th floor balcony ledge, an eye-blink away from certain death, and even worse, place one of us kids up there with her. Or the one who burnt the rice and to cover her tracks, stored it under one of the beds until she got found out when it started to stink up the house. Yin Chee, somehow, was different. She came to work for us when my mom was hospitalised with cancer. She was intelligent, hardworking and seemed to care for us. I was concerned that her cooking might not be as good as mom’s, but she turned out to be a great cook. Somehow, she took an immediate liking to me; at that age, I was extremely docile, quiet and as she saw it, prone to being bullied by the two sisters either side of me. Yin Chee came from an impoverished family; she grew up in a remote area due to her parents’ work on rubber plantations, and their RM$4 per day wage meant they couldn’t afford to pay for her to attend school. She used to catch the bus to her nearest school anyway, and would sit outside the classroom trying to absorb what the teacher was teaching. The teacher finally took pity on her and let her join the class without letting the principal know. Then the bus stopped showing up and she had to walk an hour and a half to school each morning, so she gave up after awhile, having attended only 2 years of schooling. When, at 19, she decided to marry my dad, 28 years her senior, there was some opposition to it from my older siblings. I remember being coached by Min Foong to ask them not to marry each other, and getting my speech mangled in the process and having to run back to my sister to double-check what I was supposed to say, which only served to make the situation comical. At the wedding, we were instructed to no longer call her ‘Yin Chee’, but ‘Ah Yee’ – which means ‘young aunt’ –we were to view her as a younger sister to my mom, here to fulfill her role in her absence, but never to replace her completely. Which is a shame, because I think it did affect the way she has been treated over the years. She was married to my dad for some 40 years until his passing two years ago, so whatever doubts there may have been about her motivations, her loyalty to our family has stood the test of time. I don’t know if she still feels the need to prove herself all the time, or if it’s just her no-frills personality, but she prefers to avoid the limelight and usually stays in the background cooking away at family get-togethers. She is always the last to sit down to eat, often after everyone else has already had their share, which makes me uncomfortable as it is reminiscent of her days as our maid. It also means we never celebrate her birthday or Mother’s Day etc., unlike with my Dad, for whom we always had a big celebration accompanied by ang pows. Frankly, I think she deserves better; in a family of Type A personalities, left rudderless by the untimely passing of my mom, Yin Chee turned out to be the right person, at the right place, at the right time, for us all. What a beautiful story, so do you have any step-siblings or the 8 siblings are from your mother?